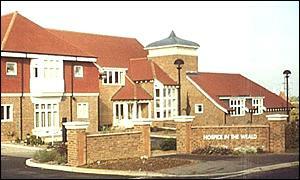 The Hospice in the Weald is warning it may have to make serious cuts unless it receives more money from the government. The centre for the terminally ill, based in Pembury, only gets 10% of its resources from the government. The national average is 28%. Other funding is gathered from donations, fundraising and from the hospice's nine charity shops. There are 65 paid workers at the hospice and about 500 volunteers, and some employees may have to go because of the funding problems. Overall �2.4m is needed every year to pay for all the resources which are provided by the hospice. As well as 10 beds, these include home care nurses, a day hospice, family support and bereavement counselling. Hospice chief executive John Ashelford said: "Without adequate funds from the government then our services, which are continuously costing more because of the increase in pay awards provided nationally for the nurses and medical people, and the cost of running expenses for the hospice, are going to go up. "And all of these expenditures next year will increase further when we suffer a 1% increase in national insurance charges. "These impositions on our hospice make it very difficult for us to balance the books."